Hello there! Hope your weekend is going well, Blake and I had a monster to-do list yesterday and through it all I miraculously made time to exercise (seriously trying my hardest to be diligent about getting in workouts throughout the week…we’re now just a month and a half away from our wedding day, eek!! ), so I ventured downtown to run the Hike & Bike trail…in the 100 degree heat…it was half miserable buuut I did it, so I was pretty darn happy and proud of myself! Also felt nice to see the light of day…I’ve been in tunnel mode with wedding to-do’s and general blog prep on my calendar, so it was really nice to step away from my computer and soak in some vitamin D! 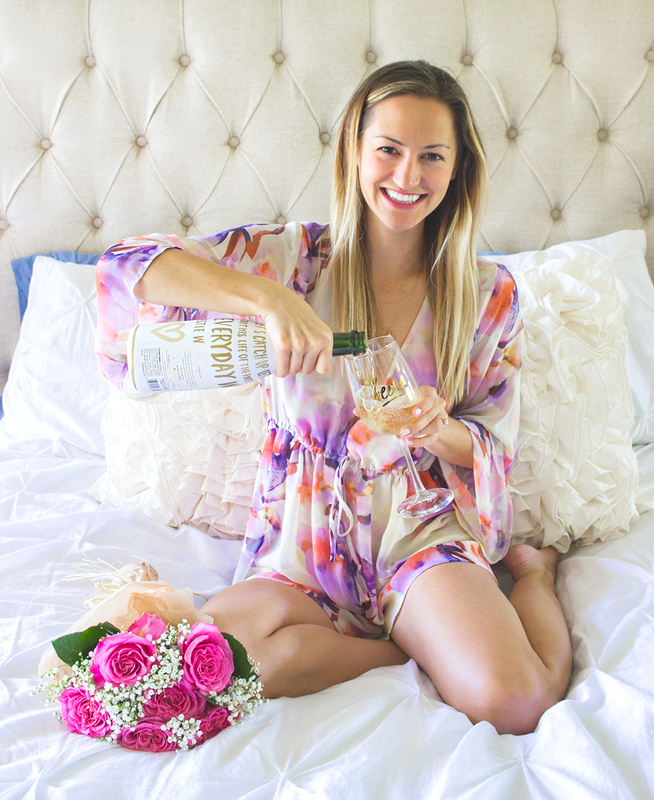 Speaking of the wedding… I am super excited to partner with Nordstrom today and share a look from their wedding suite featuring THE cutest floral romper to wear as you get ready on the big day! This romper is by Show Me Your Mumu (which y’all know I am obsessed with this brand!) and it’s the perfect blend of practical (because you can wear it over and over after the wedding and it can double as a swimsuit coverup on your honeymoon!) and fashionable – LOVE this pretty and romantic floral print! I’m wearing a size small in this romper and I highly recommend it!! It’s SO COMFY and you feel gorgeous in it – I love the bell sleeves and plunging neckline, it’s very whimsical and boho, my kinda vibe! I linked out to quite a few more “what to wear as you get ready on your wedding day” selections, so feel free to click my picks below to scope them out! If there’s any day to treat yourself to ensure you and your bridal party feel absolutely gorgeous, it’s on your wedding day! Hope you enjoy, XO!! Ps. How cute is that “cheers” wine glass by Easy Tiger? Also adorable to pass out as gifts to your bridal party! (Check out more Easy Tiger glass options here – they are SO CUTE!!). Loving this romper! 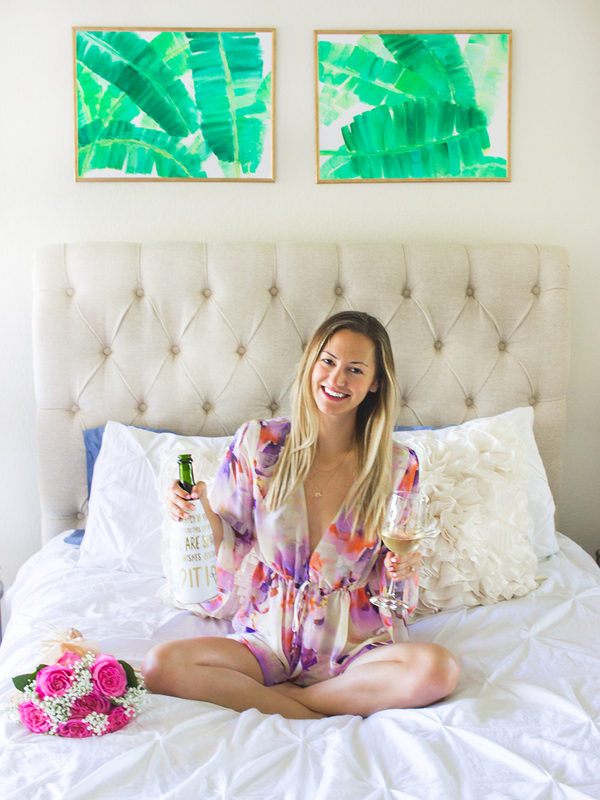 Show Me Your Mumu has the cutest options – that’s what my bridesmaids will be wearing. You look absolutely adorable and are glowing! There’s no better romper than a Show Me Your Mumu one 😉 can’t believe your big day is so soon and I can’t wait to see more photos of it! I’m in love with this romper- trying to decide between a xsmall or a small… how tall are you? I think that could help me decide! I’m in love with this romper- but I can’t decide between an xsmall or a small. How tall are you?